A few weeks ago I brought up the fact that I learn much better when I’m working through a project. For this to work it means that you’ve got to stretch yourself a little with each project that you do, taking on something that’s a challenge to you. For a lot of knitters making a garment is the holy grail of knitting. If you’ve been knitting for years but garments still terrify you maybe now is the time to take the plunge? Knitting a garment isn’t more complex than any other type of knitting BUT there are a few more things that can go wrong! For a garment to work you need to be sure of 2 things; your size and your gauge. If either of those is off then there’s a good chance that you won’t be happy with the end product! If you’re ready to get this right then these are the steps I’d suggest taking. 1. Find a pattern that you like and that suits you. To figure out what suits you take a look at your wardrobe. What do you like wearing? What makes you feel good? Now try to analyse this. Is it the style? The shape? The fit? The colour? Use this to guide your pattern choice. 2. Get someone to help you measure yourself. Take all your measurements with a light top on. Bust, waist, hips, neck, arm length and then the distance from the nape (back) of your neck to your bust/waist/hips. Once you have your correct measurements you can then make a good sizing choice. Often people end up overestimating their size and knit a sweater that’s much too big for them. Remember as well that knits are nice and stretchy so they’re pretty forgiving! 3. Pick your garment size. Now you need to take the pattern that you’re going to knit and compare it to your body measurements. Most patterns will give some ease suggestions but you should adjust this to suit your own style (remember the wardrobe check you did?) 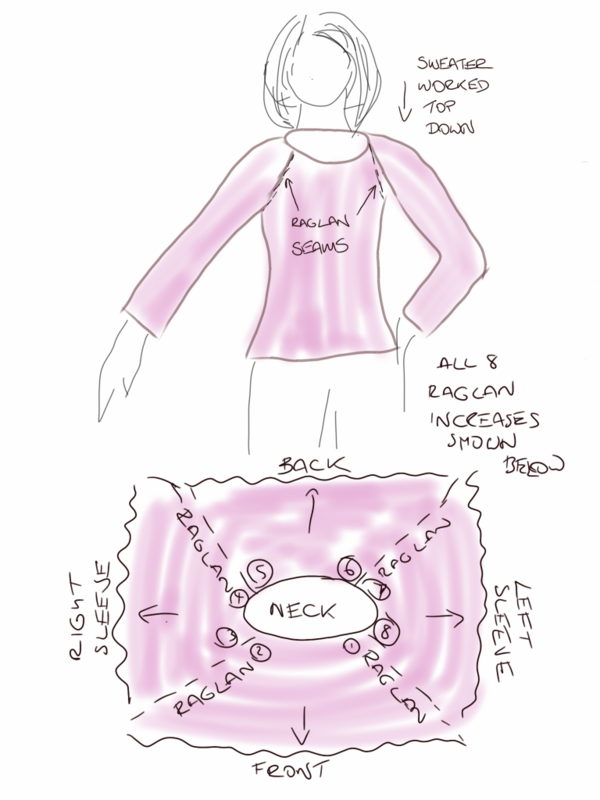 Now you should also check the schematic to see if you need to make any other adjustments for your body size. Maybe you need to make the shoulder narrower or wider? Or perhaps you need to move the waist position up or down? 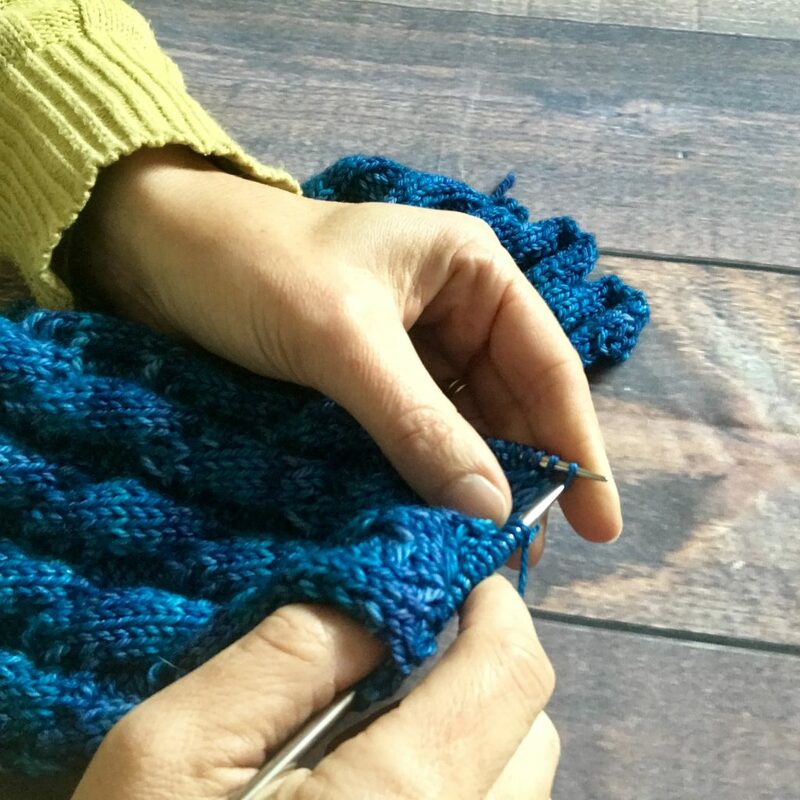 One of the most common changes that knitters need to make is to the sleeve length. If you’re working a sweater from the top down this is easy to do and you can keep trying it on and checking as you work. If it’s from the bottom up you need move the decreases closer together if you are shortening the sleeve but you might need to space them further apart if you want it longer. It can be very helpful from a motivation point of view to knit your first sweater top down. This means that you can keep checking the size as you work and it’s easier to tweak as you go along. To check your sizing all you need to do is slip half the stitches onto a second needle so that you can stretch your knitting out. I find that when you get to the full bust point and it’s fitting well it really gives you a big push to get the rest of the garment finished so that you can wear it! So once you’ve decided that you really want to try your hand at knitting a garment what’s the best way to make it happen? Usually, knitting with others is very helpful. Maybe it’s with someone you know so you’ve got an accountability buddy? Or else you could try a KAL to help keep you motivated. As you probably know a few times a year I run sweater KALs. There are always a few knitters for whom this is their first garment. At the end of this month, we’ve got the Tangential Blues KAL starting. This is a top-down sweater with raglan shoulder shaping. 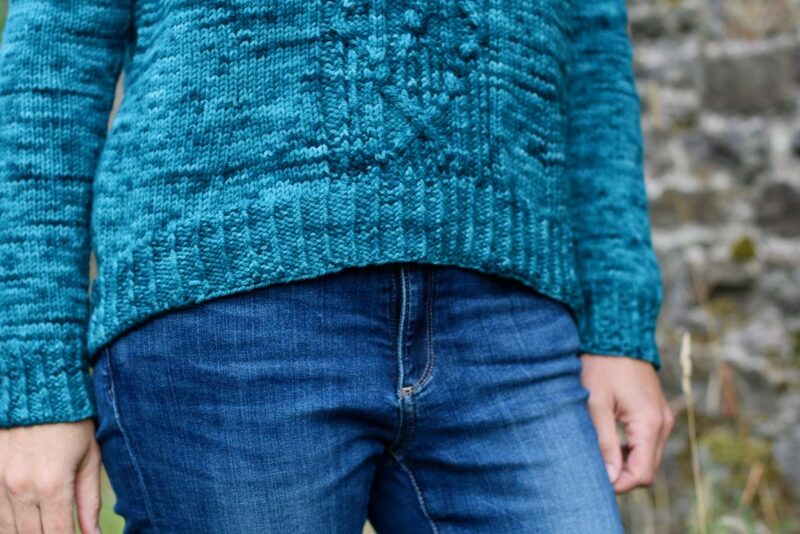 It’s got a dramatic cable at the front and a gentle short row hem curve. If this looks like a good match for you why don’t you pop in and introduce yourself here? There’s still time to get your yarn and swatch before the first clue is released. Are you going to join us? I’m issuing a sweater challenge to you all!